Has anyone ever seen a hat pattern for the one Moira MacTaggert is wearing in this picture? I am looking everywhere, but the closest looking one I have found says that it is knitted flat, and this looks like it was knit in the round to me.. 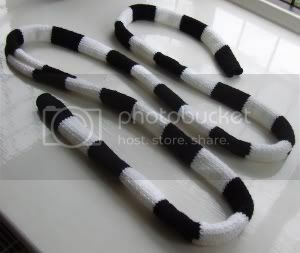 I'm new here, and I'm looking for a specific crochet pattern. There was nothing in the rules about not making crochet-related posts, so I hope this is okay :/. 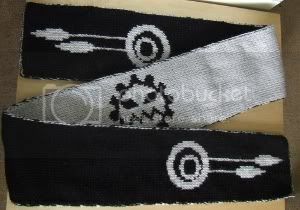 I made a Metalocalypse Scarf. It is filled with zazz. Also yarn. When I first watched the Scott Pilgrim movie, I said that I might have to make Knives' scarf. And I finally got round to doing it. I'm a lurker, crafter, and graduate student studying fandom crafting for my masters thesis, and I'm doing a short informal questionnaire about fan craft over at my journal. If anyone happens to be interested and wants to answer a few questions, I'd really appreciate it! You can find the questionnaire here. Calling all Stargate Fan Works Creators! The Stargate Multiverse Track is looking to display new and interesting Fanworks in the track room this year. There were a number of awesome things in the Museum last year, but we want to bring in even more, to show how creative Stargate fans can be. Do you make crafty Stargate-themed items like jewelry or dolls? Use your mad skills to create replicas of props from the multiverse? Make other multimedia fanworks like filk or vids? We're interested in it all! If you or someone you know makes something cool and Stargate-themed that you want to show off at con this year, drop Melayne an e-mail at melayne[at]sgmultiverse[dot]org. Hi! I just joined today and thought I'd introduce myself. I am a great big geek with a ton of fandoms. I recently (a few weeks ago) taught myself how to knit. Once I get my current non-geeky project done, I'm throwing myself into geeky knitting. I've got some Doctor Who inspired projects I'd like to do. Plus Jayne's hat and Mark's scarf from Rent. There is one thing I would like to ask you. I'm working on starting up a craft blog for myself and can't think of a good title. Right now all I can think of is The Crafty Geek. I want to use something more clever than that, but the little gray cells aren't helping me out. Any thoughts would be greatly appreciated. Feel free to check out my profile to get an idea of my geekdoms. ;) It's a long list and I don't want to bore you. TIA! Following the pattern here, I made TARDIS-esque hats for myself and my roommate. Pictures, and more info can be found (here). I don't have too much info on exactly what yarn I used, since I don't really keep track of that and some of the yarn was unlabelled when I received it. Essentially, you need a black yarn, a white yarn, and a TARDIS-blue yarn of your choice (there is quite a bit of leeway on what constitutes "TARDIS blue", as you will see). 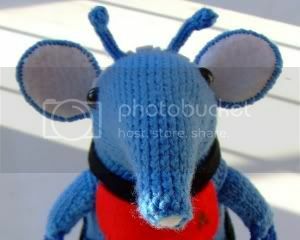 Does anyone remember my Spock Clanger?